Premium Rush, messenger movie keeping local, Vayabags Interview. What do we know about the new messenger thriller Premium Rush? We know it stars Joesph Gordon-Levitt as the hotshot fixed gear riding protagonist. We know it’s about bike messengers in NYC and premiers August 24th. But what you might not be aware of is it was entirely shot in New York City and used a lot of real messengers as consultants, actors and stunt riders. Our own Austin Horse (who took 4th place in this years Cycle Messenger World Championships in Chicago) was Joesph’s double for much of the riding in traffic and skids. Joseph Gordon-Levitt, Austin Horse and director David Koepp on the set of Columbia Pictures’ Premium Rush. Read an article on the Austin working with Joesph in Momentum Magazine. Something else you may not know is the messenger bags used in this film are hand made right here in Ridgewood Queens by Tianna Meilinger and her lady co-workers Angie and Grace of Vaya Bags. I recently got a chance to visit Tianna and her crew at the Queens shop to see the whole operation of this company who’d I’d been admiring for years. I barely made it out there on a stormy Wednesday, but I was determined to arrive before they all left for the night. Queens can be a confusing place to ride with such distinct street names as 60th Lane, 60th Place and 60th St, sometimes intersecting each other and sometimes just ending. I finally found their home base in Ridgewood and was delighted to find a dry shop, but mainly I was welcomed because Tianna is such a warm person. She showed me around the operation, highlighting the showroom of great cycling friendly bags, belts and wallets as well as the sewing area where all the magic happens. Vaya really goes out of their way to use recyclable materials and incorporates things like bicycle inner tubes, in many of their products. One of the latest products Vaya is producing is their convertible backpack that also becomes a pannier, which I’ve always seen as separate items, but never as a bag you can pull off your bike’s rack and then wear on your shoulders. Brilliant! 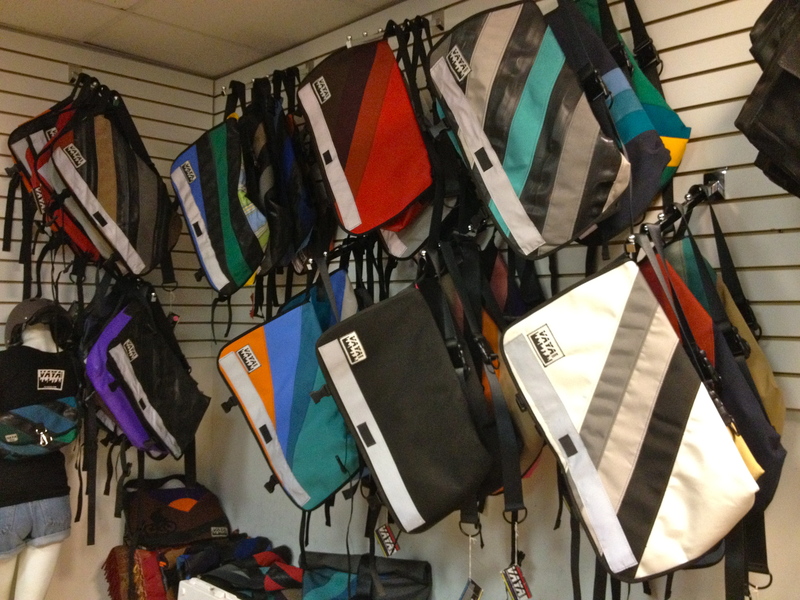 The whole store is packed with great products such as cell phone holders, handle bar bags, belts, wallets, side pouches and tons of their signature messenger bags. Now, I know there are a ton of messenger bag companies out there, but here is a woman run business, in the middle of New York City, making great bags and using recyclable materials. We got to talking for a while and I was super psyched to have Tianna answer all my questions. What is your favorite bike to ride and where in NYC. My favorite bike is my 1969 Holdsworth that I found at a garage sale and recently my favorite place to ride is Forest Park in Queens. It pretty amazing to be in the city, but feel like you are riding in a park upstate. 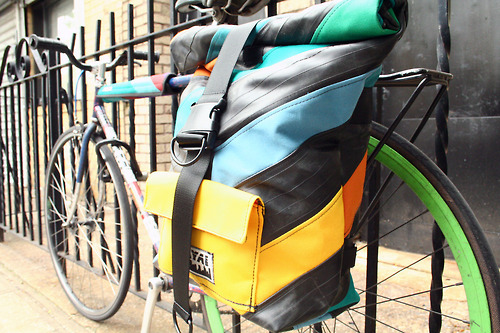 How did Vaya come about, what got you interested in making bags and other wearable cycle gear? While living in Boston, riding my bike to and from work and school, I desperately needed a sturdy waterproof messenger bag. Instead of buying one, I made myself one. Friends loved the bag I made for myself and started asking me if I could make them bags as well, and so Vaya Bags was born! Are there other owners of Vaya? Nope, just me! I started making my first bags in 2005. I figured I would make and sell bags until I found a “real” job in my field of environmental science and then never found a job that I liked more. Vaya means “go” in Spanish. I was living in Ecuador studying ecology right before I started making bags. I thought it would be nice to have a name with a bit of a Latin flare to it. I thought “Go Bags” was pretty fitting. With a lot of bag makers out there, what sets Vaya apart and makes them unique? 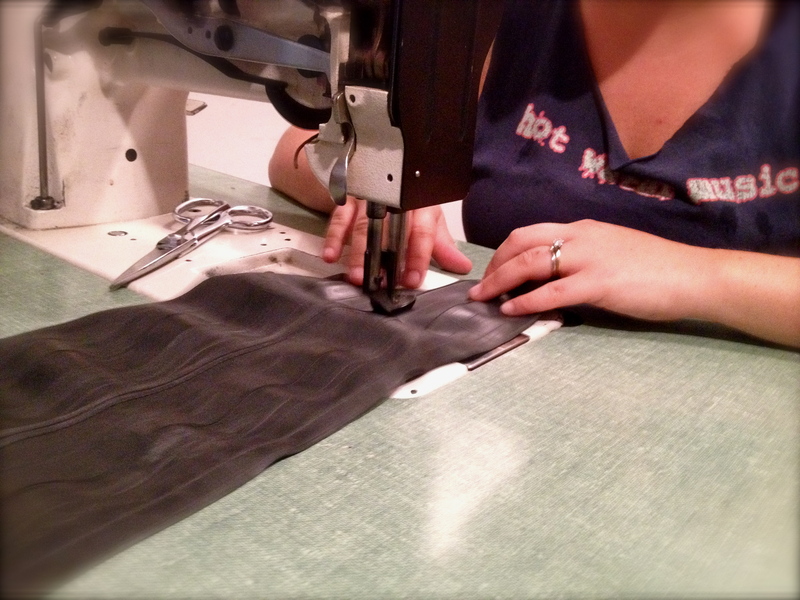 Each one of our bags is individually handmade. We don’t choose a spring-line and then mass produce a bunch of bags in the same color. Each bag is unique and has different color schemes and patterns. We also use as many recycled and scrap materials as possible. 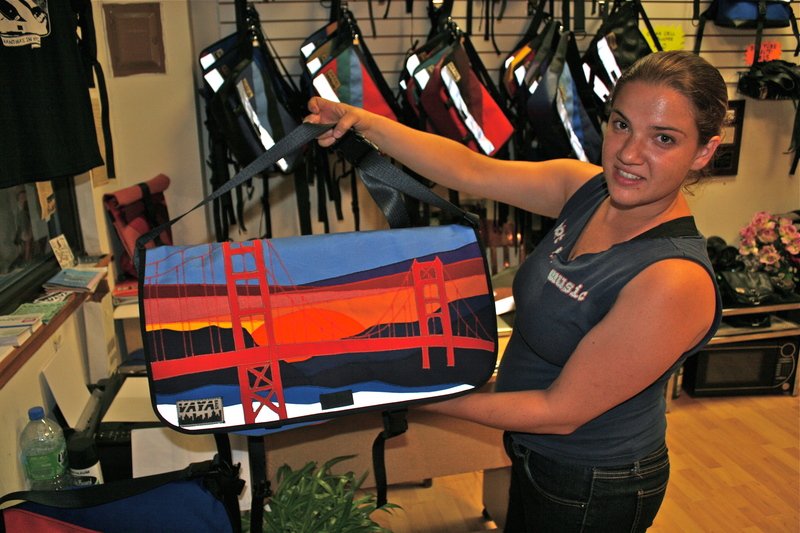 Most of our bags are made from recycled bicycle tubes, scrap sailboat awning, or old banners. As well as making our bags really cool looking and with recycled material, we strive to make them as functional and comfortable as possble. All of the messenger bags have padding in the back of the bag so stuff in your bag doesn’t stick you while you ride. Also my favorite feature is the easy adjust D ring strap, which makes it to you can adjust and swing your bag around with one hand. Did your past cycling experience help go into the creation of the bags and accessories and in what ways? When I made my first bag, I made it with the features that I would most want in a bag. Most importantly for me, the bag needed to be waterproof, comfortable, easy to adjust, and visible – thus why I use reflective tape and bright colors. Since I had the experience of my bike being my main form of transportation in the city, it definitely helped me develop a bag that is perfectly suited to people that use their bikes every day whether its for commuting, grocery shopping, or just frolicking around. Where is Vaya Headquarters and who works there? Vaya HQ is located at 70-08 60th St. in Ridgewood, Queens. There are usually 3 of us in the shop, myself and my friends Grace and Angie. 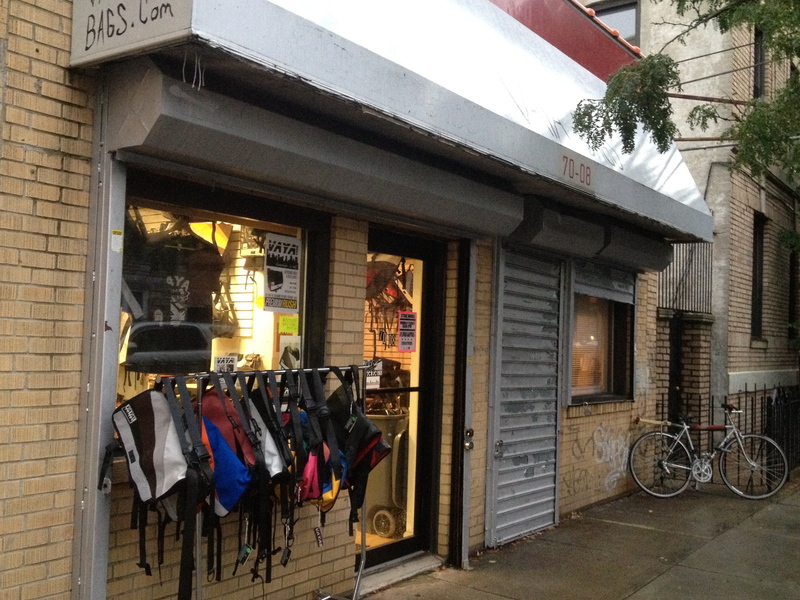 Our location in Ridgewood functions both as a storefront and a workshop. Customers can see their bags being made right in front of them and even come into the shop and work with us to create a custom bag. Its a rare thing to meet the person who makes something you are going to buy, so I think our customers really enjoy coming in and connecting with us. We also love to meet the amazing people that are going to be wearing our bags! 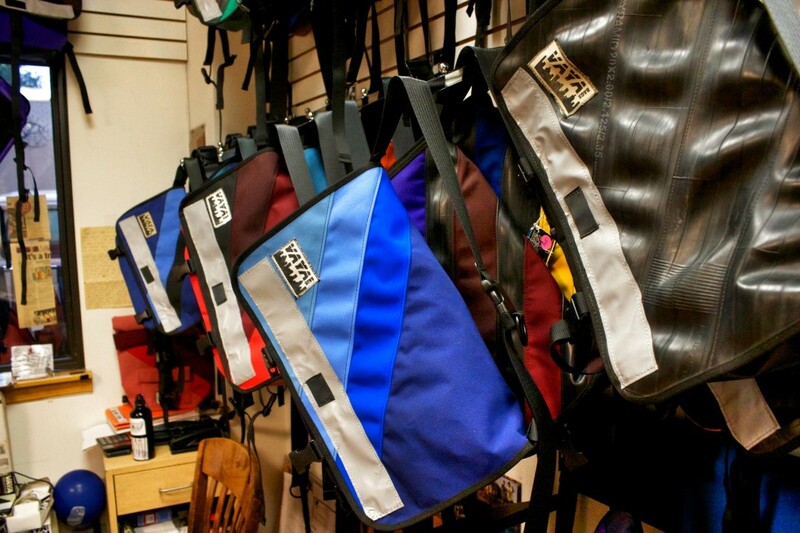 We have 4 different sized messenger bags which cater to all needs. 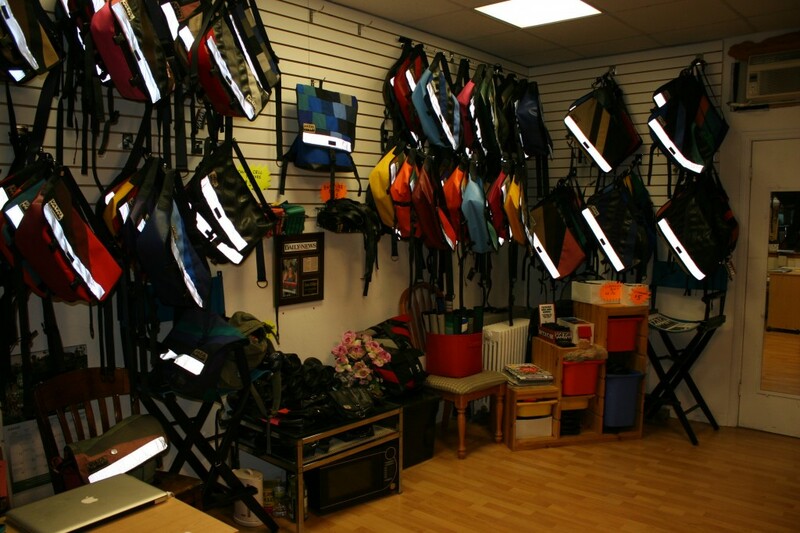 In addition, we make backpacks, laptop bags, pannier hybrid bags, and purses. We also make accessories such as wallets, cell phone pouches, top tube covers, strap pads, handle-bar bags, saddle bags, hip pouches, and belts. 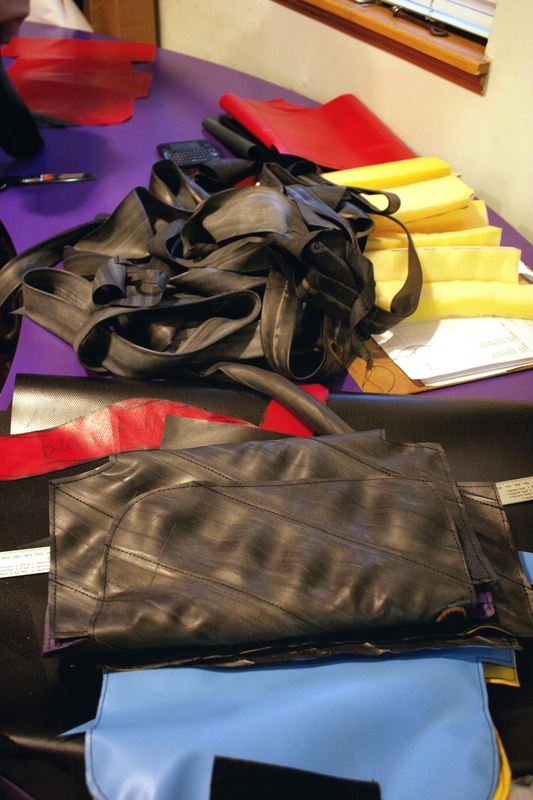 what lead to the choice of using recycled inner tubes in some of your products? Making a living out of using scrap and recycled materials kind of runs in my family. My dad made his living for 40 years making leather and suede clothing from the scraps that he found in a dumpster outside of a leather factory. I grew up with a consciousness of how its possible to create works of art using other people’s garbage. So, when I first started I immediately went on a hunt for materials that were being thrown away or wasted that I could use. I found a sailboat awning factory out on long island which made huge boat covers out of waterproof canvas, so I asked them if they had any scraps I could take off their hands. They pointed to the garbage bin and I got to work collecting my materials. We now have a really nice relationship and they often hold scraps for me so I don’t have to go rummaging through their trash bins. Eventually the idea of using bike tubes came up and after some trial and error, it became my favorite material to use. Its rewarding to know that in addition to making art (and making a living), we are also doing our part to help preserve the environment. Is this a difficult material to work with? Where do you get all the tubes (are you at liberty to say) Did this present any challenges? Bike tubes are extremely difficult to work with. I joke around to my customers and tell them that the tubes put up a good fight if you don’t know how to tame them. We had to invest in some good quality, industrial machines, but once we got the right tools, it made working with the tubes a lot easier. We get all of our tubes donated to us by local bike shops. After they change a flat tire, they’ll throw them in a box for us instead of throwing them out. Some of the lovely bike shops that are nice enough to hook us up with tubes on the regular are: Recycle-A-Bicycle, Silk Road Cycles, Bike Slug, Bicycle Planet and EMS. 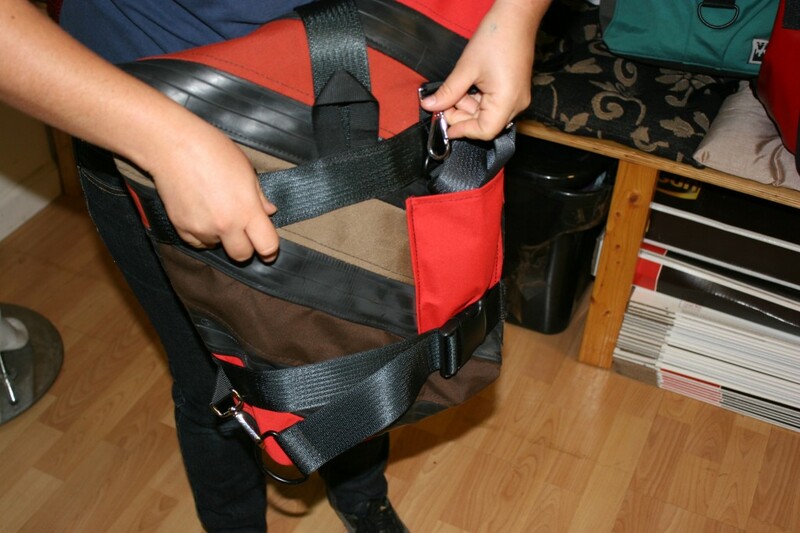 We once were asked to make a messenger bag for delivering meat from a butcher in Japan. It was going to be insulated to keep the meat cool. I’ve also been asked to make bags for fencing gear, accordions, giant bass drums, a dog bag… like a bag for a dog to carry… and a bunch of other pretty funny ones! Customers are constantly keeping me on my toes! Give us a good story about a custom bag design. We once had a request to make a bag out of an old “Dance Dance Revolution” game mat. It came out awesome, and even got bumped up to the front page of “Reddit” because people loved it so much. What lead to making bags for Premium Rush? Someone on the set of Premium Rush had one of my messenger bags. The Director and the Prop Master loved the bag and called me to see if I would make the bags for the actors in the film. 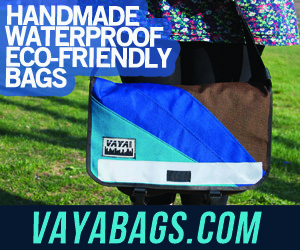 The staff of Premium Rush were interested in having an eco-friendly set and supporting local companies, so Vaya Bags fell right in line with that. They were all really great to work with and I am honored that they chose our bags! After seeing the movie are people going to rush out and become messengers? with your bags of course. Where have you sold bags to? Countries, distances away…famous bikers or celebrities? We have sold messenger bags to customers all over the world: Japan, China, Australia, New Zealand, Singapore, Italy, Germany, Switzerland, Belgium, France, UK, Canada and more… As for celebrities, Andrew Bird bought one of our bags and so did George Lewis Jr. of Twin Shadow. Also, the director of Premium Rush, David Koepp, bought Vaya Bags for the entire cast and crew of the movie, so who knows what movie celebrities are sporting their Vaya Bags! Our future plans are to continue doing what we’re doing now: making awesome handmade bags for people while maintaining a dedication to the environment and community. 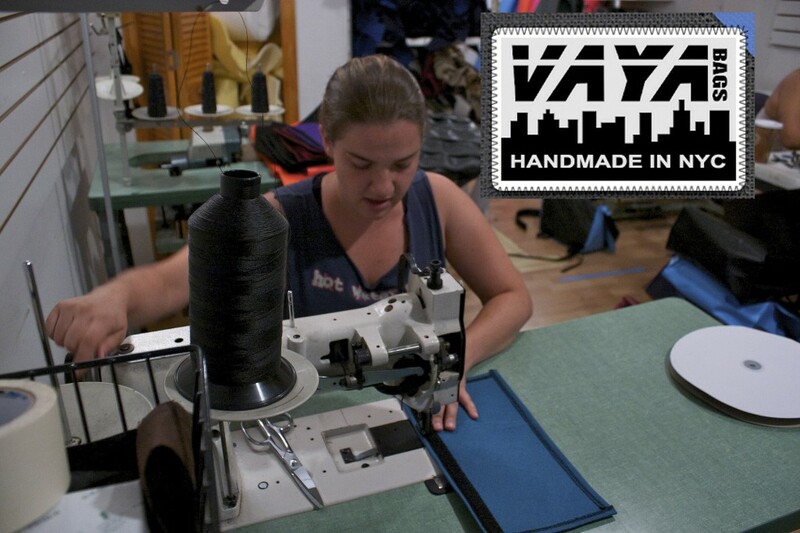 I would like Vaya Bags to be an example of an independent, women-owned & operated company that strives to meet its customers’ needs and which creates a workplace that is friendly, exciting, and rewarding. I’d like to help prove that you don’t need to sacrifice your values and squash the people around you to make it in business. 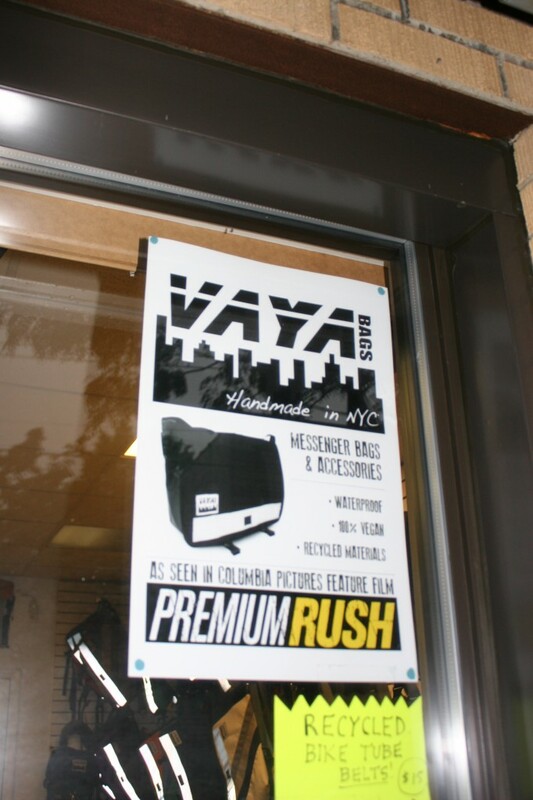 Well Premium Rush may be a hokey representation of messenger life here in NYC, after all it’s Hollywood, but on a positive note they employed a lot of people and gave attention to something that is legitimate, a real hard working local business, VAYA BAGS. If you get the chance visit the shop in person and also check their gear featured in ETSY.